Exercise bikes installed in French outdoor locations were linked to strip lighting that gradually illuminated based on pedal power and ultimately triggered a saucy animated projection to promote Nestle’s Contrex Water. Not a hologram in the true sense of the word but a Russian company has combined a Microsoft Kinect sensor with a mist screen projection to created a hologram style touch screen. Microsoft research have delivered a similar effect but using a transparent projection screen and a mirror along with Kinect. Saveme4later is a mobile app that allows people to bookmark poster creative and review the ad and product at a later time via a website or the app itself. The ad is bookmarked by typing the brand and location details into the phone or by speech recognition. Users are required to have downloaded the app in advance which has to date been promoted in various consumer magazines. 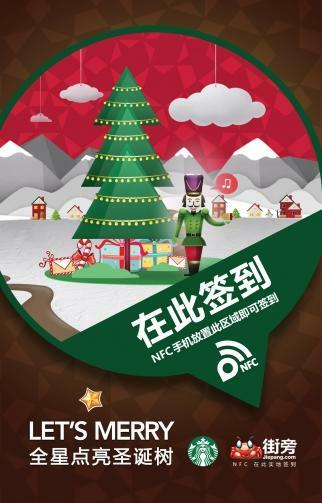 NFC-enabled smartphone users in Shanghai, Jiangsu and Zhejiang can automatically check-in at more than 200 Starbucks locations for a special Christmas deal. Users swipe their phones across ‘in-store’ postcards embedded with NFC tags, or manually using the Jiepang app in their phones. Using an online portal, participants control a robot with a baseball to smash a Vodafone piñata and release prizes to vodafone’s Facebook community.